Surprise lost a late lead, falling again on Monday, but second baseman Andy Young went 2-for-3 with a walk and RBI. Results from the game played Monday, November 12th. Surprise (10-17) could not hold a late three-run lead, resulting in a 5-4 walk-off loss at Scottsdale (12-14). A fielding error by first baseman Will Craig (PIT) opened the scoring floodgates to start the ninth by allowing the lead runner to reach. Reliever Jackson McClelland (L, 0-1) (PIT) continued his second inning of work by issuing back-to-back free passes to jam the sacks full, resulting in his departure. The Rangers’ Joe Barlow (BS, 2) then yielded an RBI single and two-run double for the loss. 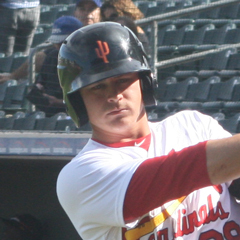 The Saguaros’ seven-hit offense was lead by the Cardinals’ Andy Young, the organization’s sole representative in the game. The second baseman reached base three times, going 2-for-3 with a walk and RBI, thus extending his hitting streak to four consecutive games and five in the last six contests. The Indiana State product came to the plate in the first with two on and two out but was unable to deliver. His 6-4 force ended the frame. After his team put up a two spot the next inning, aided by two wild pitches by the Desert Dogs’ starter, Young worked a two-out base-on-balls in the third. The 24-year-old was in the thick of Surprise’s two-run fifth. Young’s line drive single up the middle knocked in Vladimir Guerrero Jr. (walk) from second for the first tally. A 4-3 ground out scored Craig (single) and moved Young to second where he was stranded. He finished his day with a lead-off single to center to kick off the eighth. Young advanced to second via a passed ball but could get no further.